The Royal house of Scotland sprang from the Kings of the Scots, who constituted only one of the 6 peoples inhabiting the modern lands of Scotland. Yet when Kenneth, son of Alpin, united the Picts and Scots, and later when the Anglian southeast, the British southwest, and the lands of the Gaels in Galloway were incorporated into the kingdom, this royal line of the Scots appears to have been accepted without difficulty by the other peoples. It is a remarkable fact that not only the royal line, but the complete history, and mythology of the 'Scots' was accepted as the common heritage of all the people from the Tweed to the Pentland Firth. By the reign of Alexander III (1241-1286AD), it is clear that Picts, Britons, Norse, Angles, Galloway-Gaels, and Normans had all laid aside their own memories of the past and had come to regard the past of the 'Scots' as their heritage. As the Scottish kingship symbolised the acceptance of a common past, it was an important unifying factor in Scottish life. It was one of the few things contributed by West Highland Scotland to the Scottish state, and one of the very few things that linked the Highlanders with the Lowlanders. It must have amazed some contemporaries when a Highland Bard, at the inauguration of Alexander III, hailed in Gaelic this Anglicised, French-speaking king as the direct descendant of King Fergus I (the founder of Scotland). Whats even more amazing is that modern commercial ancestral DNA testing is showing just how diverse the Scottish nation once was! This diversity is reflected in the 8 different Case Studies that can be viewed on the Scottish Origenes website. Case study 1 features a test subject who's ancestors were Normans but who eventually became Border Reivers living on the often fluid and volatile Scots-English border. Case study 2 features a test subject who's ancestors were undoubtedly of Pictish origin but adopted the Clan system of the Scots-Gaels. Case Study 3 features a test subject who's ancestors were lowlanders from Galloway who became mercenaries serving in Ireland. 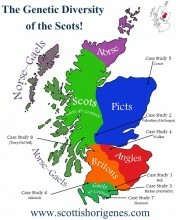 Case study 4 features another lowlander Scot but one descended from the Angles who settled in Scotlands southeast. Case study 5 features a Scots of Pictish ancestry with a surname that one almosts always assumes is of Irish origin. Case study 6 and 7 both feature Gaels from Galloway who's ancestors migrated from the North of Ireland to Scotland in the 8th or 9th Century. Case Study 8 features a test subject who's ancestors were undoubtedly Norse-Gaels who also served as mercenaries in Ireland (known as Gallowglass). If you have Scottish ancestry and have purchased a commercial ancestral YDNA37 test then the results can reveal your ancestors place within the ecleptic ethnic mix of medieval Scotland. The test results can also pinpoint precisely where in Scotland your direct male ancestor lived when he first picked his surname! What will your Scottish DNA reveal?